After my road trip through Namibia, I had the pleasure of traveling to Kenya. My first stop was Nairobi, where I visited Giraffe manor with my friend Kiersten. Upon our arrival, giraffes were right out front giving us a warm and friendly welcome. It was spellbinding to see this classic Colonial mansion on a picturesque estate with giraffes just casually meandering about! The mansion was built in 1932 and has retained every bit of its old-world charm. It is set on a 12 acre private estate which also serves as a sanctuary for 12 Rothschild giraffes (an endangered species). The giraffes are happy campers with their sanctuary home and they show it with their uninhibited and cordial dispositions. It was heartwarming to feed them while enjoying an afternoon cup of tea on the patio. But perhaps the best moment was when a couple of giraffes poked their heads through our second story windows to wake us up in the morning! They even joined us for breakfast! This was definitely the most unique breakfast I’ve ever experienced. For the rest of our stay, those friendly little heads would periodically materialize through our open windows, putting a smile on all faces present. Only at Giraffe Manor will your breakfast be pleasantly interrupted by these friendly faces popping through the windows. I also noticed what a great time was being had by the kids who were staying at Giraffe Manor. This destination makes for a wonderful family vacation experience. The hospitable staff at Giraffe Manor provide guests with information on how to best interact with the giraffes, and guests are also given giraffe food pellets. They’ve nicely thought out all details to make one’s stay a memorable experience. Although giraffes are permanent residents on the estate grounds, warthogs, impala, colorful birds and antelope are also frequently seen. The hotel itself is rich in colonial era ambience with greenery trailing down its outer walls. Art deco design and antique furniture adorn the interior. The movie “Out of Africa” was filmed here, bringing it to the public eye in 1985. It offers 10 guestrooms with en-suite bathrooms, private balconies, wifi, 4-poster beds with mosquito netting and hairdryers. The estate grounds have enchanting courtyards, lush gardens, and sun drenched terraces. Giraffe Manor only allows its guests into the sanctuary, so it never feels crowded and everyone gets to spend ample time with the giraffes. The facility includes a beauty salon, bar, lounge, parking area, boutique shop, on-site massage therapist and superb restaurant. The food was creative, colorful, delicious and always graciously served. Guests can enjoy guided walks through the sanctuary and visit the AFEW Giraffe Center. A complimentary sightseeing vehicle with chauffeur is available for guests to visit the nearby tourist attractions. These include the Sheldrick Elephant Orphanage (where one can feed and adopt a baby elephant), the Karen Blixen Museum, and various art and craft shops, namely Kazuri Beads, Matt Bronze and Marula Studios, and the Maasai Market. What’s next? Safari Collection has other fabulous properties in Kenya! 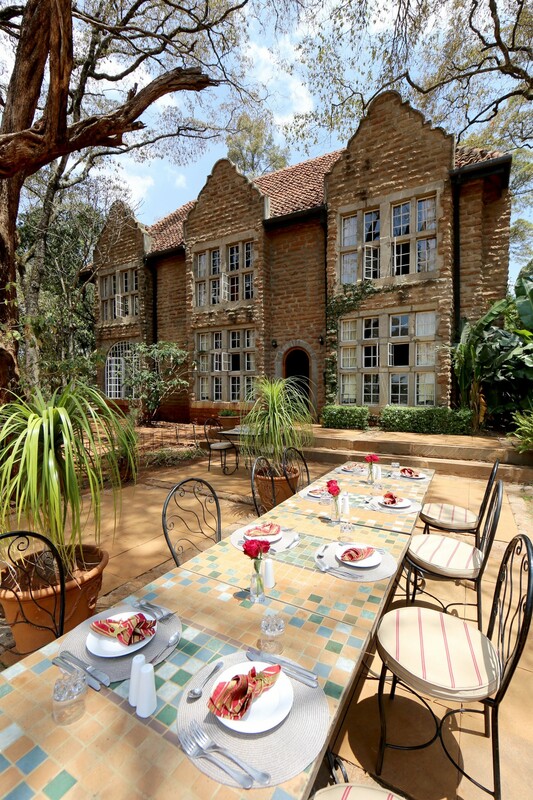 Giraffe Manor is owned by Safari Collection Hotels. They also own 3 additional properties in Kenya so I’ll give a little info on them. With each location, all meals and most drinks are included in the cost of one’s stay. Sala’s Camp is a luxury tented camp in Kenya’s Maasai Mara Game Reserve. Its 7 tents are spacious, comfortable and attractive with en-suite bathrooms. Its ideal location near the confluence of two rivers makes it a choice spot teeming with wildlife, and it boasts fantastic views of the Serengeti National Park. Sala’s Camp offers its guests a phenomenal safari, birdwatching and stargazing experience along with warm hospitality and fine dining. Sasaab in Samburu is a collection of 9 beautiful Moroccan and Swahili style luxury tents, each with a private plunge pool and open air bathroom. It is located in the middle of the African bush, yet you’ll still have wifi and quality dining. There is an abundance of wild animals to be seen on safari here and guests can also meet the Samburu people. The area can be explored via game drive or on camelback. Children of all ages are welcome. Childcare and spa services are both available to Sasaab guests. Solio Lodge in Laikipia is comprised of 5 stunning luxury cottages located on a private wildlife sanctuary. The 45,000 acre Solio Game Reserve is recognized as Kenya’s most successful rhino breeding reserve. The Solio Lodge is the only lodge on all of that acreage, so your experience here will be very intimate. They offer an abundance of activities including both day and night game drives, fishing, horse riding, and receiving a relaxing massage. There are countless exotic animals to be seen in this scenic location. You’ll also enjoy some fine dining here. I was hosted as a guest of Safari Collection, but the opinions expressed in this article are entirely my own. I love this article! Your photos and video are amazing! I can’t wait to take my daughter to the Giraffe Manor!! !